Manhattan's debutante Blair Waldorf happens to be my favorite Gossip Girl character. Her behavior and feelings vary from snobbish to sensitive, but she always (except for a few rare occasions) looks and acts totally pulled together. Her luxurious bedroom is fit for a queen---and is as pulled together as her preppy fashion ensembles. 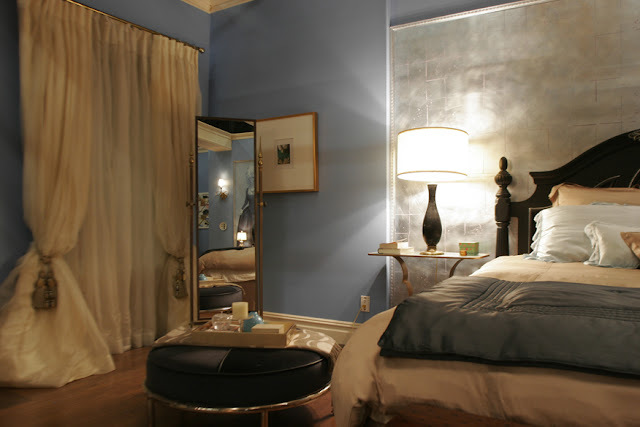 The bedroom is a dreamy mix of sky blue and creamy vanilla. Her silky bed is plush with blankets and pillows; a bench at the foot keeps magazines and books close at hand. A big, pale blue oriental rug warms up the hardwood floors. In the far corner is an elegant chaise lounge and framed photo of Audrey Hepburn, illuminated by a glittering chandelier. Rich ivory curtains drape over the large windows. Blair can admire herself in a full-length mirror. A round ottoman with a tray on top keeps track of candles and other fine necessities. Near the bed, the gold nightstand is kept clutter-free and classy with a handsome lamp and a couple books. I love Blair's dresser top. The oval mirror is curvy and feminine. Lush pink and pale green blooms freshen up the vignette, which is lit up by a small glass-based lamp. A framed photo of Blair and Serena graces the left side. Cosmetics and perfume are neatly scattered across the center. Start out with a dramatic black headboard like Blair's---whether it's wood or upholstered doesn't matter... just make sure it's got feminine curves! A brass-legged side table makes the perfect nightstand, especially with a black-based lamp set on top. Hang a photo of style icon Audrey Hepburn on your wall, and a chandelier from your ceiling if possible. Since you probably can't paint your walls to match Blair's, bring in that lovely shade of blue with long curtain panels and a floral rug. Pull a bench up to the foot of your bed to hold mags and books. Accessorize any basic dresser with an oval mirror, glass lamp, metallic photo frame, mirrored tray, cosmetics, perfume, and lush flowers to get a look similar to Blair's. Bring in a full-length mirror to check out your outfits. 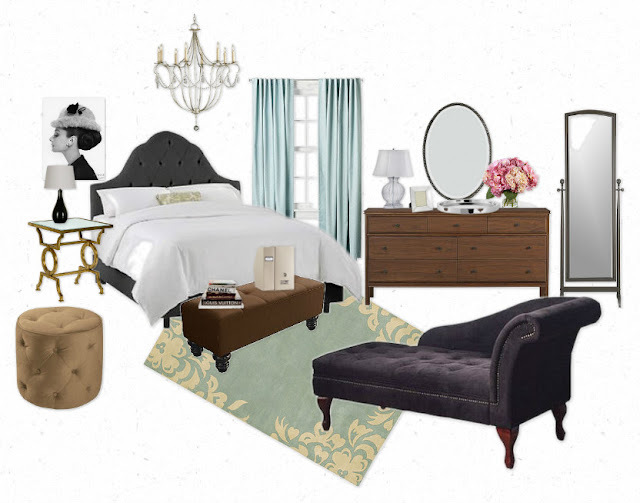 And bonus points if you can incorporate a graceful chaise lounge into the space. 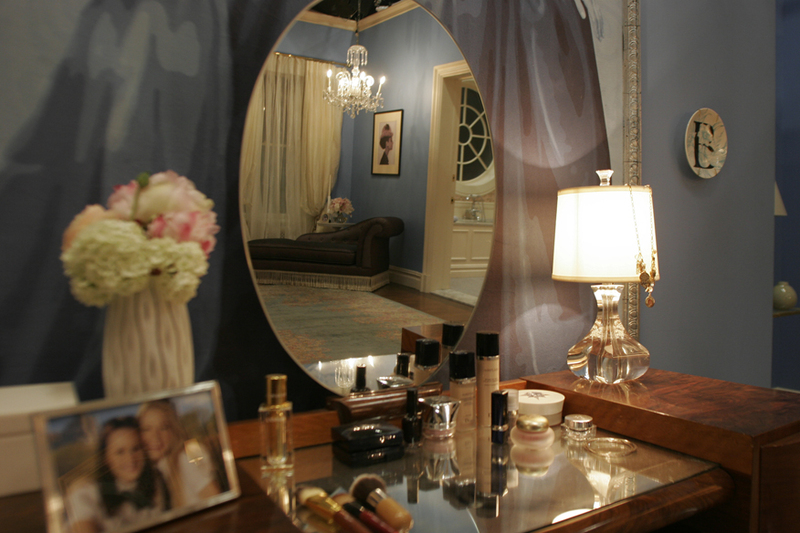 Blair's room is so posh and pull-together. Would you rather live in her or Serena's space? 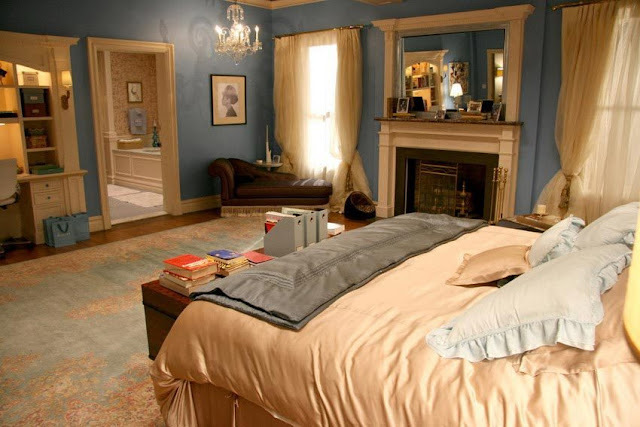 I am a huge fan of Blair's room, but you didn't say anything about the beautiful silk bedding! I second Jessica's comment. Great post otherwise though, thanks so much for this. I haven't seen so many photos of her room together in the same place before & I am currently in need of decoration inspiration. who is the woman in blue on big picture on blairs wall? i am looking everywhere but i can´t find any infos does anywone know something? where can youget thoseside tables from?? I read online somewhere it is Audrey Hepburn. It's definitely Audrey Hepburn. She is one of Blair's icons. All of her favorite movies (Roman Holiday, Breakfast at Tiffany's and Funny Face) feature Hepburn. She even uses this portrait in her dorm at NYU. I'm in the process of decorating my room... Where did you find that chaise lounge? It looks perfect! i think debbie meant this one and i don't think that that's audrey? The small black and white photo is of Audrey Hepburn purchased by either Corbis or Getty Images. The large blue Victorian one was painted on the wall by a set painter-- it was inspired by a photo of Marie Antoinette that the set designers found in a book. If you mean on the blue painting.. it is Marie Antoinette.. without a doubt ! If you mean the big blue paiting on the wall it is Marie Antoinette, without a doubt, But it is a pretty unique picture. Probably designed for the show. If anyone finds it, please let me know. I'd lov to have one. Marie Antoinette is one of my favourite women in history. It is Audrey Hepburn, she starred in many of the golden age Hollywood films such as Breakfast at Tiffany's and Sabrina, Blair has her epicure on her wall because Audrey was a style Icon. The framed picture is of Audrey Hepburn. The blue painting is Marie Antoinette. Where can I find the rug and the curtains that Blair has in her bedroom? Thank you! Where can I find the rug and the curtains that Blair has in her bedroom? do you have any info on the paint colors used in blair's room?